Fortinet has launched improvements to its FortiCloud management system and a new series of cloud-managed wireless access points, proceeding the company’s planned investments and impetus in the secure wireless networking market. “FortiAP-S series” is the most reliable cloud-managed enterprise Wi-Fi products on the market, characterising Fortinet’s cybersecurity technology running directly on the AP and the latest security updates from the FortiGuard Labs Threat Intelligence services team. There are so many challenges while deploying and managing wireless LAN solutions in a distributed organization for their customers and employees. Existing wireless LAN solution frequently requires complex architectures to segment guest and internal networks, separate WLAN controllers and security appliances. 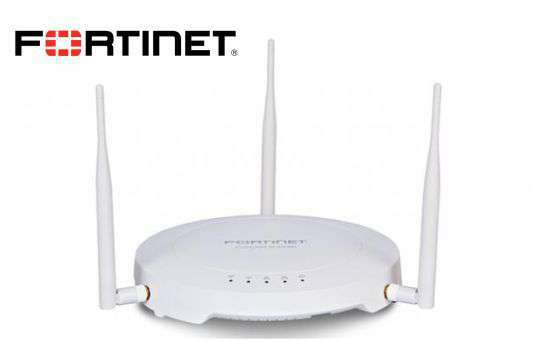 While emerging cloud-managed Wi-Fi vendors have assisted to diminish the complexity and management problems associated with deploying wireless networks, moving WLAN control into the cloud has initiated security challenges that still facing problems..
Fortinet’s new FortiAP-S series of wireless access points allow industries to precede separate WLAN controllers without exposing the network to cyber-threats. Every FortiAP-S series access point is centrally managed through the cloud-based FortiCloud management system, enabling effortless Wi-Fi network deployment and management, increasing security, visibility and control, and reducing overall infrastructure complexity. Rajesh Maurya, Country Manager, India & SAARC at Fortinet stated,”Fortinet’s new FortiAP-S series combines the flexibility of cloud management, the latest generation of wireless access point technology and the proven security of FortiGuard, all forming a secure wireless architecture for enterprise access networks,” and said, “We can now apply mobile-specific security policies and updates such as application control and virus scanning directly to the wireless access points, giving the customer a layer of perimeter defense for BYOD devices.”This makes it easy for industries to implement and manage a secure Wi-Fi network, at the same time scalability of cloud management makes the solution ideal for distributed enterprises that may have thousand of sites. The FortiAP-S series APs are come up with advanced security features like intrusion prevention, web filtering, rouge AP detection, antivirus security protection, granular application controls and more, all running directly on the access point. These features are all backed by FortiGuard Labs’ industry-leading threat intelligence to ensure each FortiAP-S is protected against the new advanced threats, in real-time. This revolutionary level of hardware & software integration is only achived by Fortinet’s expertise and commitment to high-performance security engineering and research.